No Skidding® offer a full range of heavy duty two part anti slip coatings that are suitable for most surfaces where an excellent quality anti slip product is required, indoors and outdoors. Our coatings provide a decorative, durable and safe coating to protect from injuries due to slippery surfaces. Concrete, wood (patios/stairs), metal, etc. 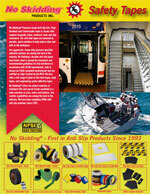 are areas of concern that can be addressed with an appropriate No Skidding® coating. No Skidding® anti slip coatings are an excellent choice for industrial or commercial users or for the homeowner because of ease of application. After appropriate surface prep, merely apply one of our coatings that are supplied with detailed application instructions. For painting or janitorial contractors, our No Skidding® coatings are a great choice to add to your product offering for your commercial customers who are concerned for the safety of their staff and visitors. All prices are per U.S.Gallon (3.78L). 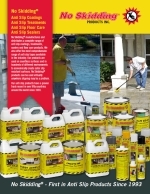 Most products are available in one gallon or two gallon kits. Roller Application on concrete, steel, and many other substrates. available in clear with clear texture. Non-yellowing. AU-73 can also be used over intact, old paint in most situations. For exterior and interior use. Durable two part solvent based anti slip coating that provides tough anti slip protection and also protects floors from chemical penetration and physical deterioration of the existing surface. Low Luster. Available in a range of colors. Durable two part solvent based anti-slip coating that is anti-slip and also protects floors from chemicals and physical deterioration. Available in a range of colors. Priced / gal, packed per 2 gal per kit.